Carlen Gardner and the new BWR-MX Athletics-LTEC-SSI Decals rig. 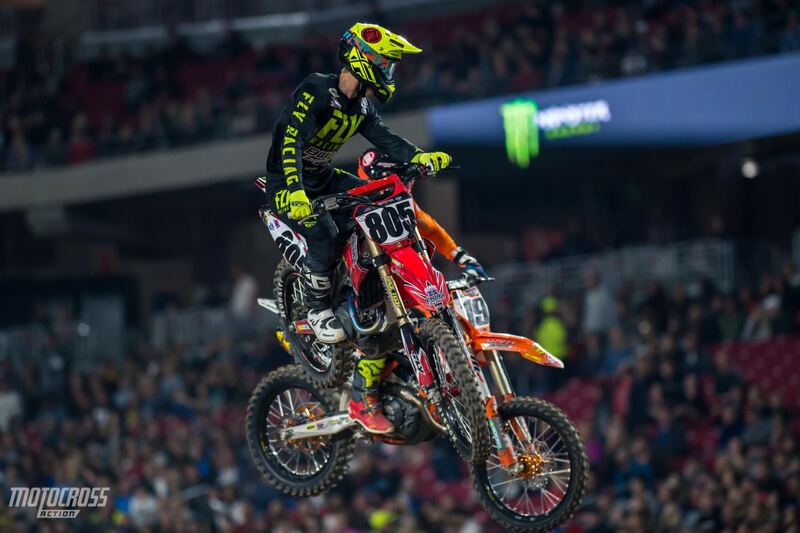 The 21-year old Paso Robles, California native is making a name for himself after qualifying for the 450 main event at the first two rounds of the Supercross season. With such a stacked 450 class this year, Gardner is proving to himself and the people around him that hard work and persistence pays off. Carlen has been professional for three years and he’s qualified for three 250 West Coast main events and four 450 main events now. We sat down with Carlen Gardner to learn more about the young BWR Honda rider. CARLEN, YOU’VE STEPPED IT UP SO FAR THIS YEAR, WHAT IS DIFFERENT FOR YOU IN 2019? Honestly, nothing major is different for me other than believing more in my program. I still have a lot of the same people who have supported me over the years and the same training program on and off the track as last year, but this year I truly do believe in everything I have been doing. 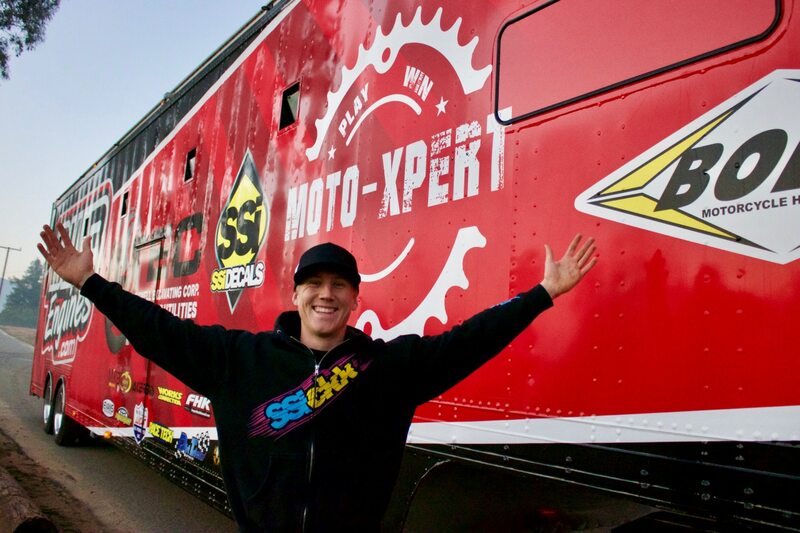 I have been very busy on the off season with all kinds of side work/activities that really made me appreciate a lot of things with racing and made me want to really continue working hard at racing Supercross. Carlen finished 9th in the heat race and qualified straight into the main in Glendale. HOW DID THE BWR TEAM COME ABOUT? Team BWR came about in 2016 when I turned Pro at Hangtown for outdoors. The connection was made by Chris at Race Tech mid-season for me to do some outdoor races back east for BWR. I didn’t get to ride for them in 2017 but rejoined in 2018. I ran my own program for 250 west coast Supercross series with the support of BWR and then joined with them on east coast to race some 450 rounds and I finished off the season in the 450 class with them. I have become great friends with Brian White over the years. He told me that for 2019 he wanted to go bigger with his program and I was all about it. I can’t be more happy with how everything has come together in such a short amount of time and with the people who are supporting the whole team as well. 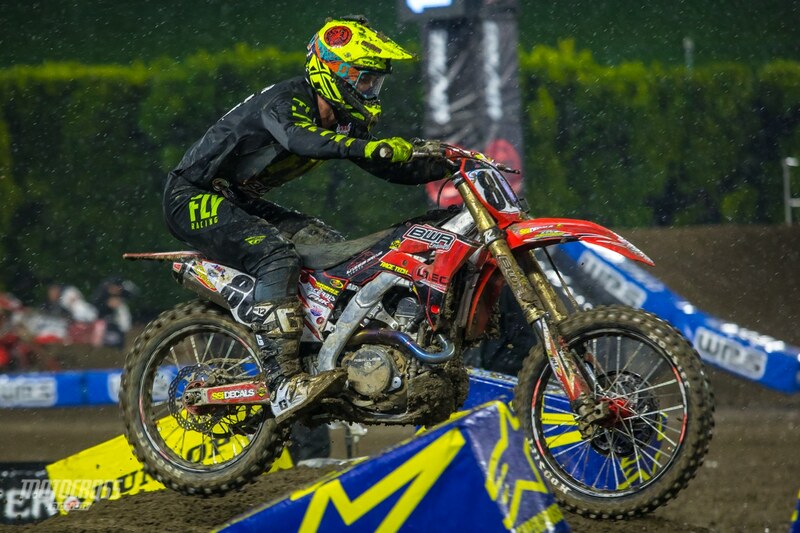 Carlen charging through the rain at Anaheim 1 in the 450 main event. Carlen grabbed the holeshot and won the 450 LCQ with Chad Reed finishing second. WHAT IS IT LIKE LINING UP FOR A 450 MAIN? The feeling of lining up for a 450 main event is something you can’t really explain. It is an honor to be able to do something in a sport that you have looked up to your entire life. But once you get passed day dreaming, you have to focus in and realize it’s time to do the actual work part. That is to race a Supercross track on a 450cc motorcycle against 22 of the fastest riders in Supercross that night for 20 minutes. All in all it’s awesome. For me it’s the least stressful race of the night right now because my goals are just to consistently make the mains. Once I’m in the main, I get to go ride my dirt bike in front of thousands of people for one last time for that day and I love it. Gardner seat bouncing in Glendale on the slick Arizona dirt. WHAT DID YOU THINK ABOUT THE TRACK IN GLENDALE? The Track in Glendale was really good. In practice the track held up very nicely all day. I did struggle a bit in the untimed session just being to tight and rushing things a bit. But the more time got on the track, the more I dialed it in and I became more confident. For the main events it started to dry up and get really hard packed and tricky, especially the whoops. The was my biggest weakness this weekend but I will have it figured out for next time. 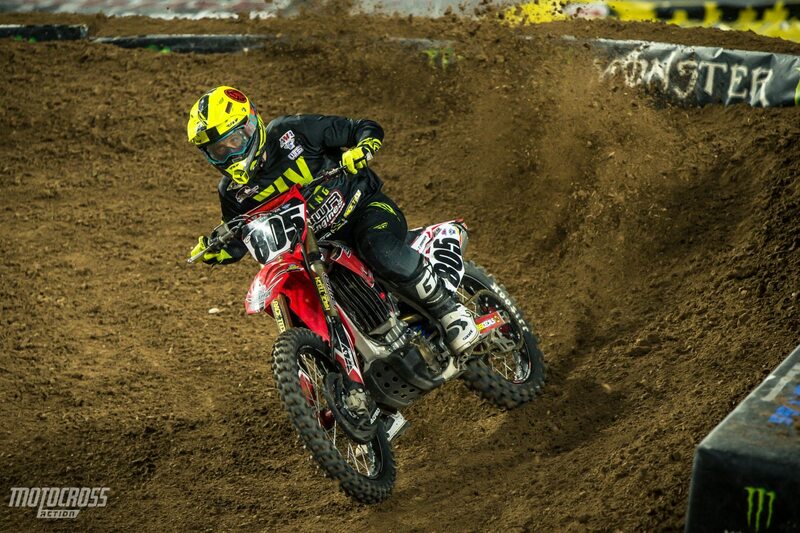 Carlen finished 17th at Anaheim 1 and 18th in Glendale. The young 450 rider is making a name for himself and proving that hard work pays off. HOW WILL YOU KEEP THE BALL ROLLING GOING INTO A2? For Anaheim 2, and the first Triple Crown race of the season I need to just continue doing what I am doing. Which is learning the track at my own pace, riding it to the best of my ability and taking it as it comes. Being smart is the key to progression each night and making sure you stay healthy for the next 15 weekends of racing. 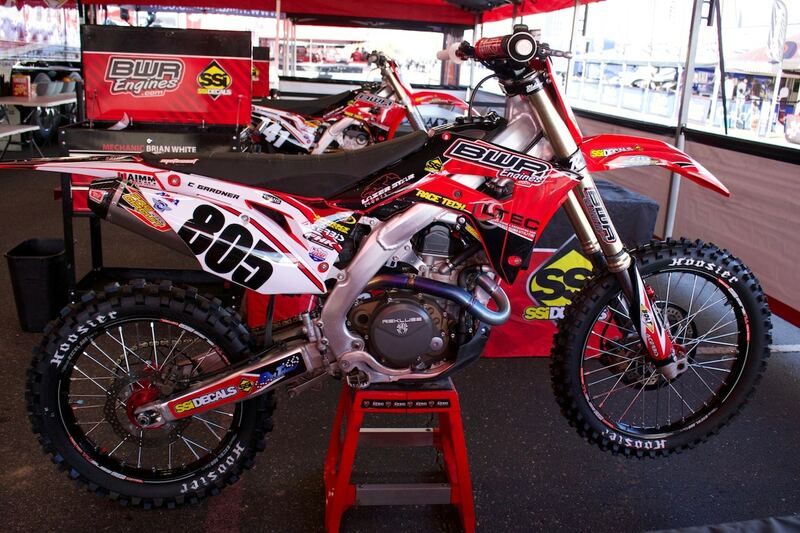 Carlen’s BWR-MX Athletics-LTEC-SSI Decals Honda 450.
WHO HAS HELPED YOU GET TO THIS POINT IN YOUR CAREER? I can’t thank everyone enough who believes in me and helps me make my dreams come true. BWR Engines, LTEC Underground Utilities, SSI Decals, Moto Xpert, Lazer Star Lights, Bolt Motorcycle Hardware, Mx Athletics, Race Tech, Fly Racing, Rekluse, Pro Circuit, Lucas Oil, Hoosier Tire, Mika Metals, DT1 Filters, Acerbis, Works Connection, Dirt Tricks Sprockets, Ride Engineering, Moto Seat, Evans Coolant, Tubliss, Scott Goggles, Gaerne Boots, Mobius Braces, Scorpion Pre Workout, Bryan McDonald, Clear Choice Property Management, Crown Limos 805, J Bond Insurance.